SALT LAKE CITY -- The boos directed toward Deron Williams seem to lose a little bit of steam each time he returns to Utah wearing a Dallas Mavericks uniform. Time surely has healed some wounds, as almost six years have passed since Williams’ ugly divorce from the franchise that drafted him. But the biggest reason that Williams’ Salt Lake City tenure feels like a distant memory is because the Utah Jazz’s present and future finally are bright again. With Friday’s closer-than-it-should-have-been 103-100 win over the Mavs, Utah improved to 17-10 despite several injuries that have limited the Jazz’s preferred starting lineup to a grand total of a dozen minutes together. 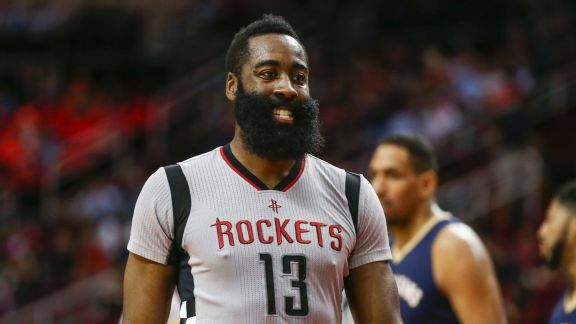 The Rockets smashed the single-game 3-point record, launching 61 and notching 24 in a 122-100 win over the Pelicans. There is statistical evidence that suggests the Jazz, a franchise that hasn’t won a playoff game since Williams was playing for coach Jerry Sloan, should be considered a sleeper contender. Utah ranks fifth in the NBA in net rating (plus-7.2 points per 100 possessions) and joins the Golden State Warriors and Los Angeles Clippers as the only teams among the league’s top six in both offensive and defensive rating. “Man, they’ve put a solid group together,” Williams told ESPN before Friday’s game. “They definitely went through some rebuilding years, kind of collecting assets and draft picks. They definitely have an identity now. They have a great mix of youth and then experience, adding Joe [Johnson] and Boris [Diaw] and George Hill, guys like that to complement the young guys they have. Utah looked like a team on the brink of a playoff breakthrough after going 40-42 last season, missing a postseason bid by a game. They feature an intriguing core of Gordon Hayward, Rudy Gobert, Derrick Favors and Rodney Hood, players developed by the Jazz who are either just entering or approaching their prime. General manager Dennis Lindsey then quietly made three smart summer moves to add playoff-tested veterans. Trading the 12th overall pick for Hill, a tough, smart, skilled point guard who is the perfect fit to lead the young Jazz, was a particularly savvy move. The Jazz, who are 8-3 when Hill hasn’t been sidelined by a sprained right thumb or sprained left big toe, sure could have used their floor general in crunch time Friday night. Utah looked lost offensively while their 15-point lead disappeared, getting only two buckets in the fourth quarter before Hood’s full-speed, pull-up, game-winning 3-pointer in the final second. But that has been the exception for the Jazz. Their jump from the bottom six in offensive efficiency last season (100.6 points per 100 possessions) to sixth this season (108.4) serves as a warning that Utah will be a team to be reckoned with in the Western Conference. The additions of Hill, Diaw and Johnson certainly have helped the Jazz’s offense. However, the improvement of three returning starters is what has fueled the team’s scoring success. Hayward, 26, the lone player left from Williams’ tenure in Utah, keeps getting better. His scoring average has risen all seven of his seasons in the league, and he leads the Jazz with 22.5 points per game despite a broken left ring finger that caused him to miss the first six games. Hood, 24, has established himself as an excellent complementary threat on the other wing. He has bumped his scoring average from 14.5 to 16.0, improving as a shooter and ballhandler, consistently hurting teams who try to load up against Hayward. But it’s the emergence of the 24-year-old Gobert as a threat that has really unlocked the Jazz’s offense. The exceptionally long-limbed 7-footer was an offensive liability earlier in his career, struggling to set solid screens, catch the ball at times and finish in traffic. No longer. Gobert, who led Utah in points (16) and rebounds (10) Friday while recording his sixth straight double-double, is averaging double-digits in points (12.0 per game) for the first time while leading the league in field-goal percentage (67.7). He also ranks second in the league with 5.8 “screen assists” per game, according to NBA.com stats. And it seems like Gobert is just getting started. His December offensive production: 14.3 points on 77.6 percent shooting. Gobert, whose balance has been a focal point for the Jazz’s strength and conditioning staff, is now one of the league’s most ferocious finishers. Case in point: The too-high lob from Dante Exum that Gobert managed to catch well above the square on the backboard and threw down hard with one hand in the first half Friday. The attention defenses must pay to Gobert makes life a lot easier to his teammates. A skip pass often creates a wide-open corner 3-pointer because a weak-side defender has to worry about Gobert rolling to the rim. The lanes for the Jazz’s ballhandlers become bigger too. “It really adds a dimension to our offense when he’s a threat at the basket,” Hayward said. Add the Jazz to the list of threats in the West, for the first time since Utah fans loved Williams.